I am happy to make this special announcement about the film "I Will Follow" and the fact that I'm hosting a screening THIS SATURDAY in New York City at 6pm (all details below). April R. Silver of AKILA WORKSONGS, Inc.
Silver is proud to support the efforts of ImageNation and Urbanworld in presenting the New York City theatrical release of the critically acclaimed film "I Will Follow," starring Salli Richardson-Whitfield, Omari Hardwick, Blair Underwood and Beverly Todd. 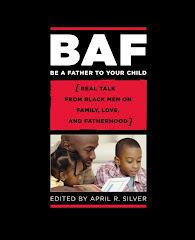 ImageNation [www.imagenation.us] and Urbanworld [www.urbanworld.com] are members of the African American Film Festival Releasing Movement (AFFRM). Maye (Richardson-Whitfield) is a success. Hot career. Hot boyfriend. But when her world is turned upside down by tragedy, she must struggle to keep her balance. "I Will Follow" chronicles a day in the life of a woman at a crossroads, and the twelve people who help her move forward into a brave, new world. 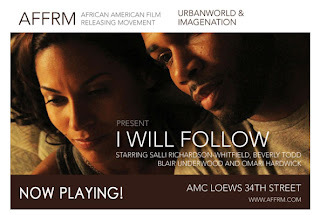 "I Will Follow" is written and directed by 2011 NAACP Image Award nominee AVA DuVERNAY.